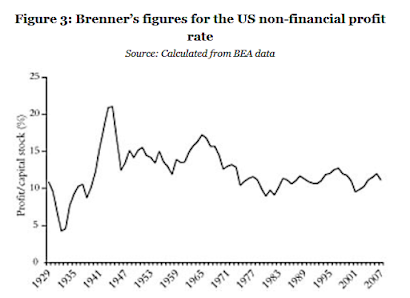 And so immediately we must ask: why do so many Marxists seem to ignore this fact and assault us with data on profit rates from c. 1945 to today, when their starting point was a period with abnormally and unusually high profit rates and this skews their data? Robert Brenner’s data for the US non-financial profit rate from 1929 to 2007 is in the graph below, as taken from this post here. I am unsure where the data actually comes from, but perhaps Brenner (2002) or (2006). Notice the spike in profit rates from 1940 until about 1946/47. During the war, wages were held down but significant price inflation did occur, and so the business profit rate rose. I suspect you would find the same phenomenon in Canada, the UK, Australia or New Zealand in these years too. So therefore a Marxist graph of profit rates from c. 1945 to 2016 – even if it did show a fall in the average rate of profit – does not prove that capitalism has a long-run tendency to a falling rate of profit, because such data would start out from a time when profit rates were abnormally high in the first place. In reality, we would need good, accurate and consistent data from the early 1800s to today in a large sample of capitalist countries to draw any legitimate conclusions about the long-run tendency of the rate of profit in real world capitalism. Brenner, Robert. 2002. The Boom and the Bubble: The US in the World Economy. Verso, London. Brenner, Robert. 2006. The Economics of Global Turbulence: The Advanced Capitalist Economies from Long Boom to Long Downturn, 1945–2005. Verso, London and New York. I do not think you are suited for Twitter. You seem like a guy who likes to slow down and dwell on things at length and with some thought. A 140 letter limit LK would be the total opposite of the one we know! The Marxist theory predicts a higher rate of profit ("abnormally" so, if you prefer) after a crisis, though. And that doesn't refute my point above. In reality, we would need good, accurate and consistent data from the early 1800s to today in a large sample of capitalist countries to draw any legitimate conclusions about the long-run tendency of the rate of profit in real world capitalism. Here's a recent study incorporating 14 countries going back to the 1860's. Hope that helps. So, wait: these figures are net profits after taxes? If so, since tax rates for businesses were obviously far lower or non-existent in the 19th century and it is obvious data collection was far from complete in the 1800s and much of this 1800s evidence must be very patchy, the data for the 19th and early 20th centuries in these graphs are badly skewed. All in all, this article still doesn’t vindicate your case or Marxism. Kliman's 2011 book shows comparable trends in before-tax figures, at least as far as the postwar USA is concerned, because the primary cause of the fall in the rate (capital accumulation) is prior to taxation. Other factors may also contribute to an after-tax measure -- better wage shares, changes in tax policy, etc. -- but these are all pertain to distribution, whereas the final constraint is always going to be in the sphere of production. And yes, even the best-available compilation of 19th century data is incomplete. We can only work with what we have, which has improved a good deal through the efforts of economists such as Piketty (upon whom Maito draws). If you'll accept nothing less than a study with perfect data, then you're demanding an impossible standard of argument. But in that book Kliman's methodology is confused, and overstates the volume of capitalist profits--which biases the trend of the data downward. The government revenues arising from sales and property taxes are simply not the same as capitalist profit. Nowadays the majority of what comes in from property and sales taxes is spent on transfer programs--public pensions, single-payer government healthcare, etc. This money and the social wage cannot be called capitalist profit. At the very least it should be considered part of the wage fund, but you can quibble over the finer details--whatever it is, however, it is certainly not surplus value. And that doesn't even get into the book's methodological confusion over the measurement of the capital stock in the denominator of the RoP. The argument that using historic pricing is the only accurate measure makes no sense if the fixed capital is also measured net depreciation. Depreciation revalues the capital stock--if you accept that the fixed capital can be revalued over time, then there’s no reason not to use current pricing; valuing it at its historical/purchase cost confuses the money advanced for the means of production at a particular point in time with the value of the means of production itself. And it’s pretty clear why Kliman doesn’t want to use current cost measurements: it restores a downward trend to the data, whereas the Marxists that have used current costs in their rate of profit calculations have demonstrated a rebound in the rate of profit in the 1980s. If it is unpaid labor, it is surplus value. The focus on the relations of production is the hallmark of Marxian economics; taxation is a separate, distributional matter. Thus, it's not at all unwarranted to use EBITDA when studying production. And no, there is no methodological confusion over historic pricing. Profits are measured in money terms -- money revenues minus money advanced. Changes in the value of the MoP affect the value of output, but not the money already advanced. Thus, "confus[ing] the money advanced for the means of production at a particular point in time with the value of the means of production itself" is precisely what one does by using current capital stock costs in the determination of profit. There's an entire section devoted to showing why the measurement you're advocating doesn't result in anything that can be termed "profit" at all. Perhaps you missed it? But you don't even need to go hunt it down; just think the matter through. Capitalist spends $5000 (4000C+1000V) to net $5500 output (500S). If the value of the MoP fall by half after purchase, then the output value will follow suit to $3500. Whether the capitalist is able to sell his output above value or only at its new value, the profits or losses of that period are evaluated against the $5000 advanced, not the $3000 of current capital value. If he only makes $3500 off of a $5000 investment, he performed worse than the miser who merely stuck that money under a mattress, yet if we go by the current capital-value method you propose, we'd still be logging a profit of $500. A capitalist who can lose $1500 and claim to have gained $500 probably will not be a capitalist for much longer. Thence to measure the capital stock at its historic/purchase price net depreciation is a methodological contradiction. Depreciation is always charged at current prices, since its value cannot be determined without reference to current productive conditions. In other words, you cannot avoid the influence of current prices on the fixed capital stock. Kliman's attempt to avoid this is part of what causes him to adopt a method at odds with itself, as what he ends up arguing can't be revalued--the historic price of the fixed capital stock--is revalued in his measurements through depreciation. "I am unsure where the data actually comes from..."
It says it on the graph. BEA. By the way, neoclassical theory would also predict a falling rate of profit in the long-run. Twitter is an alien plot to encourage idiots to identify themselves, thus saving the aliens the bother. Whether this is to harvest them, or save them as the best slaves, is unclear. I was a former Marxist-Leninist,and I abandoned Marxism-Leninism precisely for being too dogmatic and unable to make a self-criticism of his theories. I am now a reformist Marxist, and I agree with you, the Labor theory of value is very wrong. Now, I am in favor of a mixed economy, a midpoint between a planned economy and a market economy. PS sorry for my bad English, I'm Spanish. Ever heard of Michal Kalecki? That's the "good" kind of Marxism.